This was a fun challenge! Here is Annie Elizabeth Wright, my husbands great grandmother. The best part of the story is of how I got the cemetery picture. 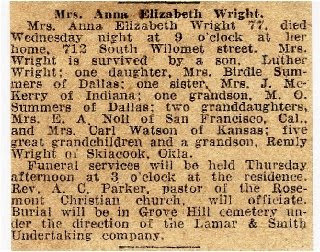 Grandma Annie is buried in Dallas, Texas. I planned to go to the cemetery when I got there from California, but nobody would go with me. I was a stranger so I wanted someone to go with me. Nobody would go. I called the cemetery and talked to the sexton, a very nice man, and he assured me she was there and he would take me to the grave. But still nobody that I knew would go with me. I called the local police to ask if it was safe to go there alone. This is what I was told after alot of hemming and hawing: :"A white girl in a late model car shouldn't go there." Well, now I am scared, but I still wanted a picture. So this is what I did. I mailed a disposable camera and a self addressed stamped bubble envelope in another bubble envelope to the cemetery and enclosed a small donation and a note to please take photos of her grave. In a week or two I recieved it back. This darling man took the whole roll, every angle possible of the stone. Now I always think of that story when I think of Annie E. Hockenberry Wright. Love it! There are wonderfully kind people all over this great land, indeed! You were very clever!And there are many nice people out there! What a delightful story, Diane! Next time you call me, and my husband and I will go with you! We live about 45 minutes west of the cemetery in Fort Worth. It's so sad when we have to be afraid to go somewhere in broad daylight. It makes me want to apologize for the city. Your idea of the disposable camera was smart. No kidding, if you ever decide to visit again, give me a call!